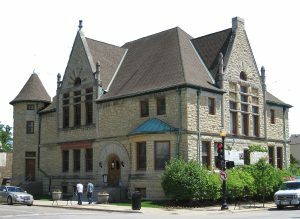 The DuPage County Historical Museum was designed by Charles Sumner Frost, among five DuPage County architects saluted at the Wheaton Museum. Five local architects are featured in a new DuPage County Historical Museum exhibit giving insight to the men behind the buildings and their important role in DuPage County’s history. Charles Sumner Frost, Wheaton’s Adams Memorial Library; R. Harold Zook who is responsible for his namesake, the R. Harold Zook Home and Studio in Hinsdale. All but Charles Sumner Frost resided in the county according to Zachery Bishop, Curator for the DuPage County Historical Museum said. Frost designed the building which currently houses the DuPage County Historical Museum as well as “Navy Pier and the Potter Palmer Mansion which was located in the Gold Coast neighborhood of Chicago before its demolition,” he said. These buildings embodied the Beaux Arts Movement, a popular style from the 1890s to 1910s that emphasized grandeur and elegance, Bishop added. The idea for the exhibit began after Wheaton’s historic Seven Gables home, built by Hunt, was relocated from its former site as part the Loretto Convent to make way for a new subdivision in 2017. “We went out and took photos before the property was moved,” Bishop said. The 1897 Tudor Revival home was set for demolition until a Wheaton couple came forward to pay for the costs of relocating the home 500 feet—saving it from the wrecking ball. The Beaux Arts-style Wheaton Theatre designed by Brydges had at one time housed live drama, silent films and vaudeville performances. The theater is now closed, but Bishop said there is a local organization raising funds in hopes of restoring the property and reopening it. Brydges also designed Glenbard West High School in Glen Ellyn, Bethel Evangelical Lutheran Church in Westmont, and the Cutten Estate in Downers Grove. The exhibit will showcase photographs and objects about the designs of Zook on loan from the Hinsdale Historical Society, which moved the Zook Home and Studio in 2005 to save it from demolition. Bishop said Zook designed Cotswold-style cottages with roofs that imitated the appearance of English thatch roofs. Zook often added cut-outs and incorporated spider webs into the design, he added. Griffin, another local architect, received a degree in architecture from the University of Illinois at the turn of the last century and was most noted for his part in developing the Prairie Style of architecture. In addition to his involvement with many suburban housing projects, Griffin was chosen out of more than 130 submissions for the design of the city of Canberra, Australia. The exhibit is set to run until February 2019.